The Federal Reserve Board of Governors’ recently released statistics on the financial accounts of U.S. households. The release shows continued improvement in the financial position of U.S. households with real estate. In fact, the household real estate equity position improved to a level last reached in the second quarter of 2007. According to NAHB tabulations of the quarterly series, the asset value or market value of owner-occupied real estate held by U.S. households increased by $758 billion dollars or 3.9%. The liability total – home mortgages – decreased by $37 billion or 0.4%. The equity position, the difference between assets and liabilities, increased by $795 billion or nearly 7.9%. The figures provided by the Federal Reserve Board of Governors are not adjusted for inflation. Therefore, it is useful to examine the owners’ equity in real estate as a percentage of household real estate. The ratio is calculated by taking the equity position divided by the market value of owner-occupied real estate held by U.S. households. The higher the ratio the more favorable is the financial position of U.S. households with real estate. 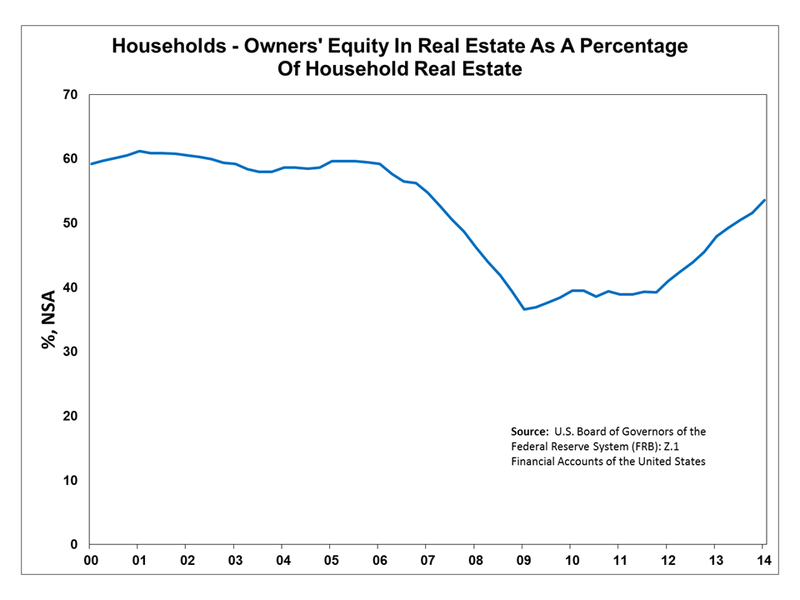 The current ratio of owners’ equity in real estate as a percentage of household real estate is 53.6%. The ratio was last at this level in the first quarter of 2007. The ratio has rebounded rapidly since the first quarter of 2009 when it was at an all-time low of 36.6%. The quarterly series shows continued improvement in the balance for U.S. households with real estate. This should not be a surprise given the increase in home prices and the low mortgage rates. The continuing improvement in the financial position of U.S. households with real estate is a welcome sign. The improved equity position represents fewer underwater homeowners, thereby unlocking housing supply and demand. Data from Standard and Poor’s indicates that house prices rose in December 2013. According to the release, the seasonally adjusted S&P/Case-Shiller HPI – 20 City Composite rose by 0.8% in December 2013. This is the 23rd consecutive month-over-month increase for the Index. Over this time period, the Index has risen by 21.7%. For the entire year of 2013, the 20 City Composite Index grew by 13.4%. The Federal Housing Finance Agency (FHFA) also released data on house prices. According to its seasonally adjusted House Price Index – Purchase-Only, house prices rose by 0.8% in December 2013. The FHFA House Price Index – Purchase-Only has now increased for for 24 of the past 26 months, rising by 14.8% during this period. Over the year, the FHFA House Price Index – Purchase-Only has climbed by 7.7%. 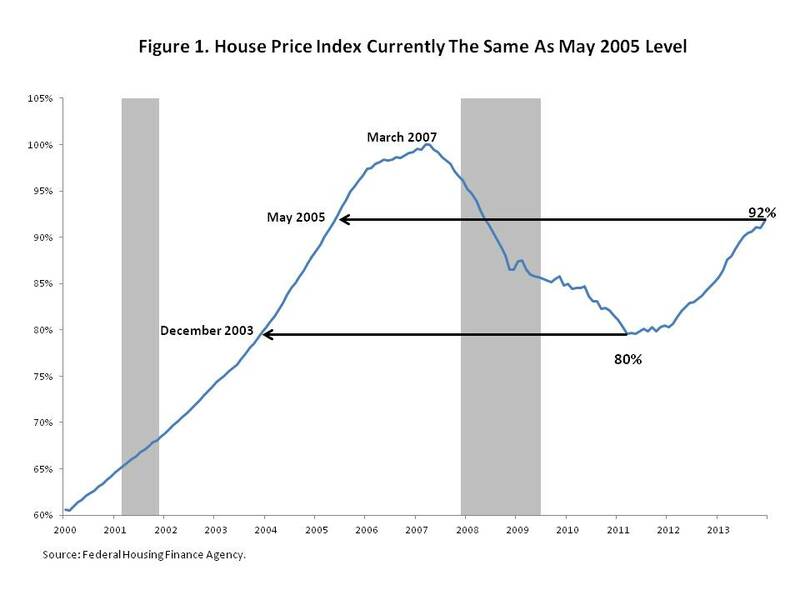 As Figure 1 shows, following the 15.3% increase in the FHFA House Price Index – Purchase-Only that took place between April 2011 and December 2013, house prices are roughly the same as the level recorded in May 2005 and are now at 92% of the peak level reached in March 2007. A previous post demonstrated that the recovery in house prices is a key contributor to the renewed expansion in housing equity. In a related fashion, rising house prices should also help expand the amount of homeowners with positive housing equity, shrinking the amount with negative housing equity. 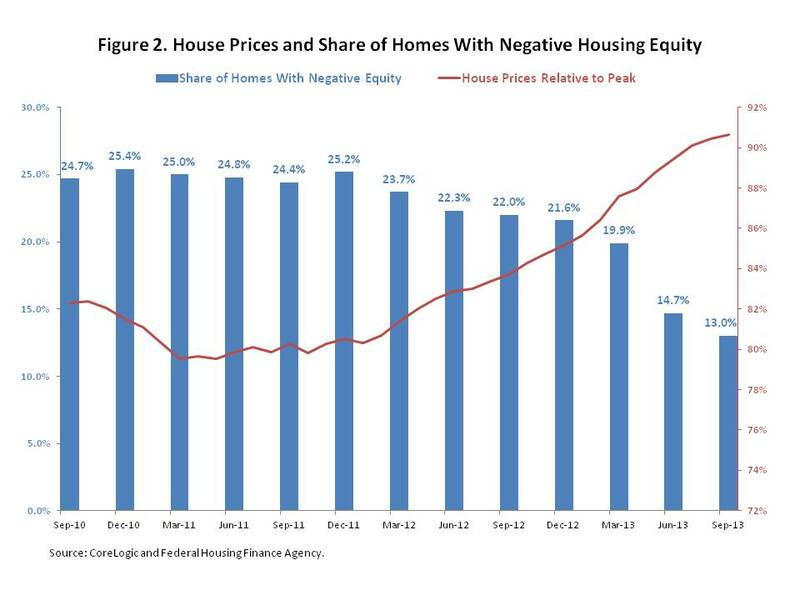 Figure 2 juxtaposes the FHFA House Price Index – Purchase-Only data displayed in Figure 1 onto a chart depicting the share of homes with negative housing equity. According to this chart, house prices in December 2011 were at 81% of their March 2007 peak. By September 2013, house prices reached 91% of this peak level. At the same time, the share of homes with negative equity reached 25.2% by the end of the fourth quarter of 2011. However, by the end of the third quarter of 2013, the share of homes with negative equity had fallen to 13.0%. Given that the FHFA House Price Index – Purchase Only ended the fourth quarter of 2013 at 92% of its peak, the share of homes with negative housing equity is expected to end the year even lower. 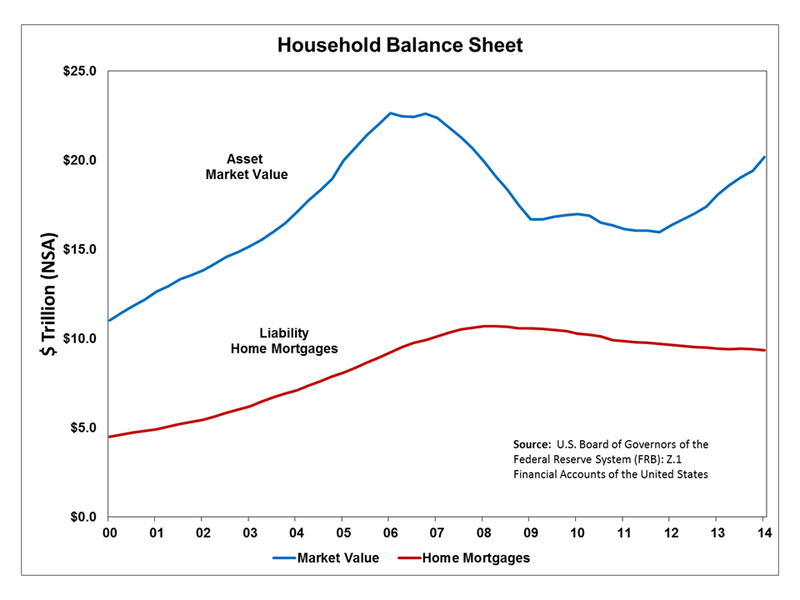 During the second quarter of 2013, household balance sheets improved with increases in home values and reductions in mortgage debt, boosting household net worth. Since the 4th quarter of 2011, the aggregate value of owner-occupied real estate is up nearly $2.8 trillion. However, while balance sheets in aggregate have mended since the end of the Great Recession, income growth continues to lag. The future of housing demand will be determined by, among other factors, income growth for existing workers and employment opportunities for newly forming, younger households. This will be particularly true as the share of cash buyers for existing and new homes recedes in the year or two ahead. Household balance sheet repair proceeds nonetheless. The graph above plots the current value of net worth to disposable personal income (NW/DPI) and the corresponding 25-year historical average (1982-2007). 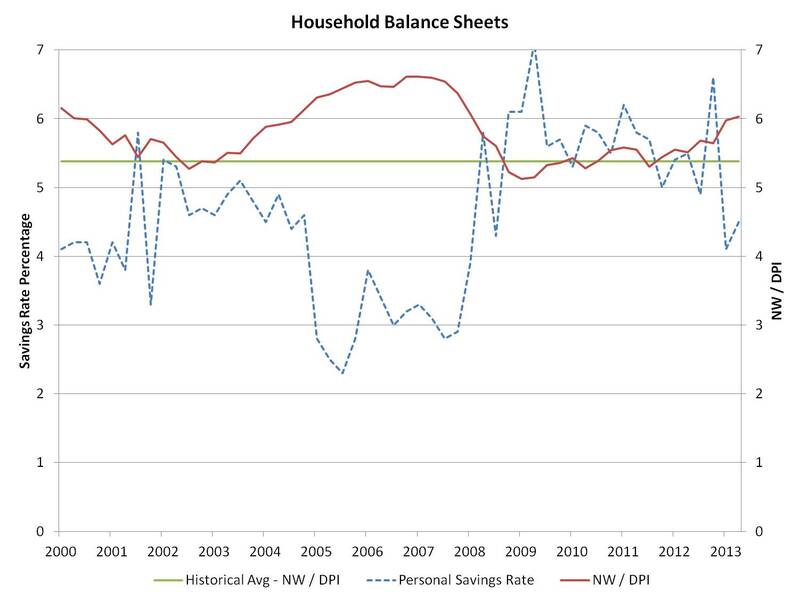 The dashed blue line charts the personal savings rate. Household net worth data are from the Federal Reserve’s Flow of Funds and the savings rate and disposable income data come from the Bureau of Economic Analysis National Income Product Accounts (NIPA). After data revisions, as of the second quarter of 2013, the NW/DPI measure stood at a value of 6.03, above the historical level of 5.38 and significantly higher than the cyclical low of 5.13 set during the beginning of 2009. These improvements resulted in pushing the savings rate down after rising during the financial crisis and reducing household consumption. 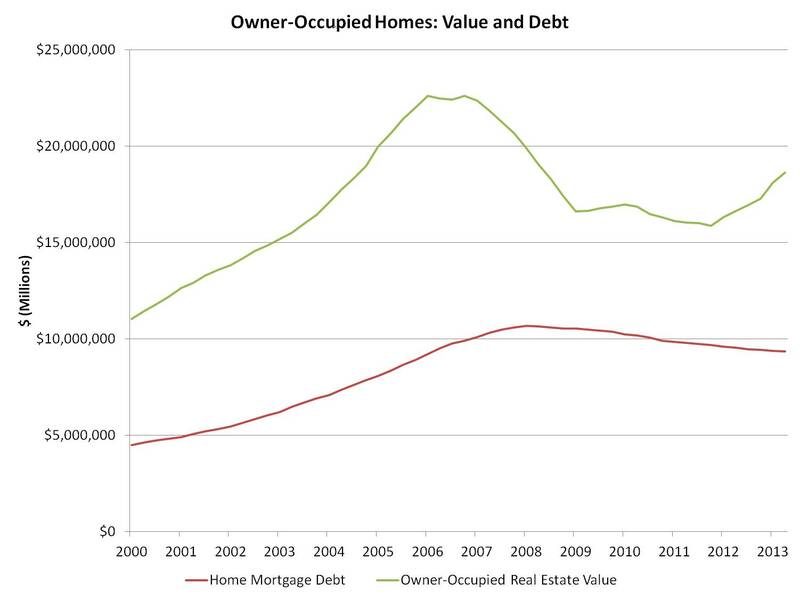 Flow of Funds data from the first quarter of 2013 show that total home mortgage debt also continues to decline. Since the first quarter of 2008, home mortgage debt has fallen 12% or $1.32 trillion. And due to rising home prices, the value of owner-occupied homes has risen since the last quarter of 2011 by $2.8 trillion. Due to these improvements for household balance sheets, another challenge brought about by the Great Recession is a greater obstacle to future economic expansion: lagging income growth. 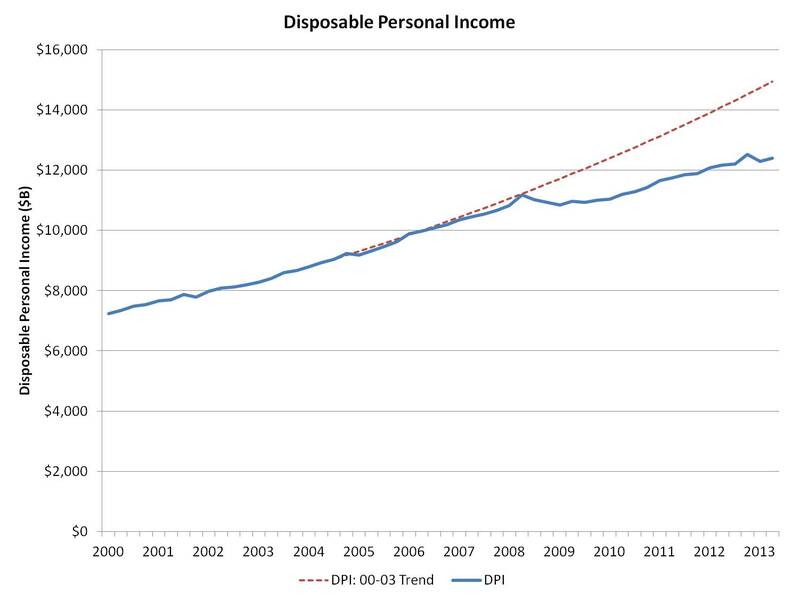 NIPA data for disposable personal income (blue line below) show that a gap has opened between current levels and the 2000-2003 trend (red line). More job creation and additional income growth will, if realized, help support housing demand going forward. Data released by the Federal Reserve Board indicates that consumer credit continued to expand in July, albeit at a slower pace than in the recent past. According to the Federal Reserve’s G.19 survey, consumer credit outstanding grew at a seasonally adjusted annual rate of 4.4% and now stands at $2.9 trillion. However, the growth in consumer credit outstanding recorded in July was 0.7 percentage points less than the 5.1% growth rate recorded in June and 2.4 percentage points less than the 6.8% growth rate recorded in May. The expansion in consumer credit reflects a rise in non-revolving credit, but the growth rate in non-revolving credit slowed over the month. An earlier post illustrated that non-revolving credit is largely composed of auto and student loans. In July, non-revolving credit outstanding grew by 7.4%. However, the July growth rate of non-revolving credit was 2.0 percentage points slower than the growth rate recorded in June. 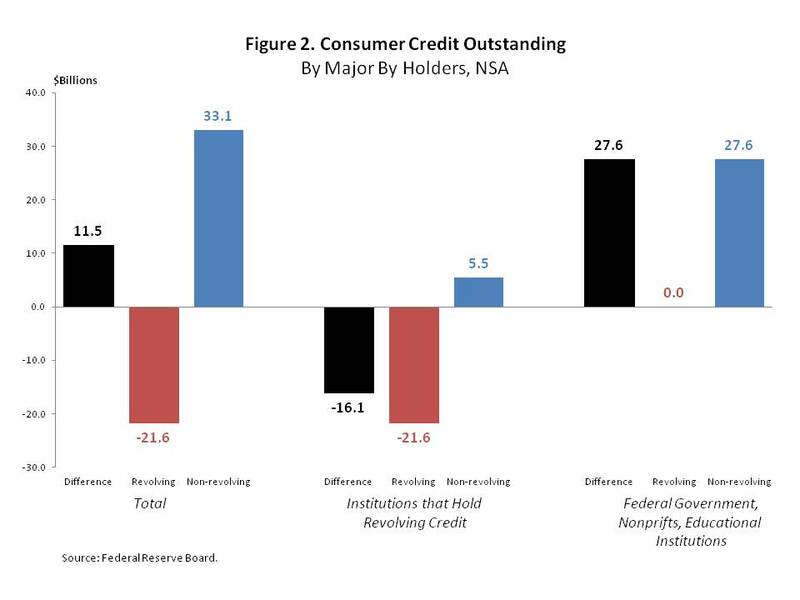 The rise in non-revolving credit was partially offset by a decline in revolving credit. This is the second consecutive month that revolving credit, which is largely made up of credit cards, fell. However, the rate of decline in July was smaller than the rate recorded in June. According to the release, revolving credit declined by a seasonally adjusted annual rate of 2.6%. 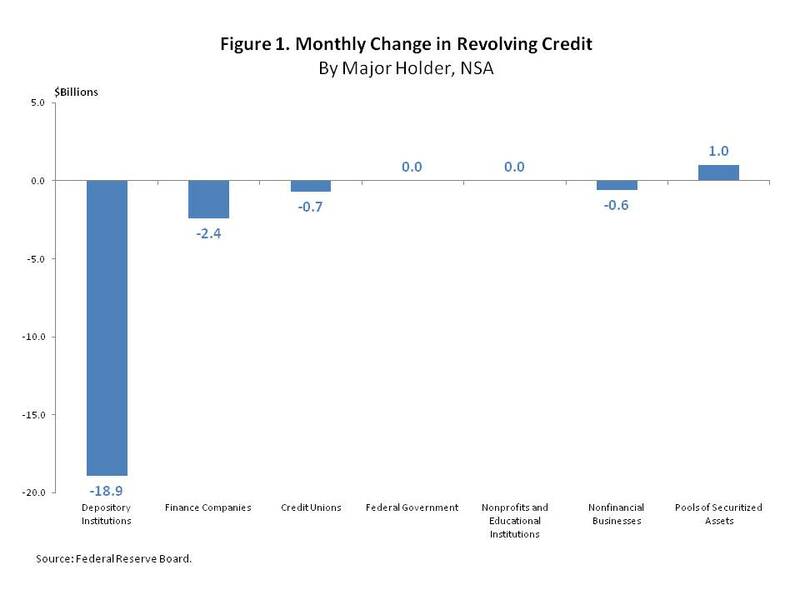 In June, revolving credit fell by 5.2%. Household debt data from the Federal Reserve Bank of New York indicates that historically, the amounts of credit card and auto loan debt outstanding were roughly similar. According to Chart 1, in the first quarter of 2003, the FRBNY estimated $641 billion in auto loans outstanding and $688 billion in credit card debt outstanding. By the first quarter of 2011, following the boom and bust experienced in the U.S. economy, auto loans outstanding totaled $706 billion while credit card loans equaled $696 billion. 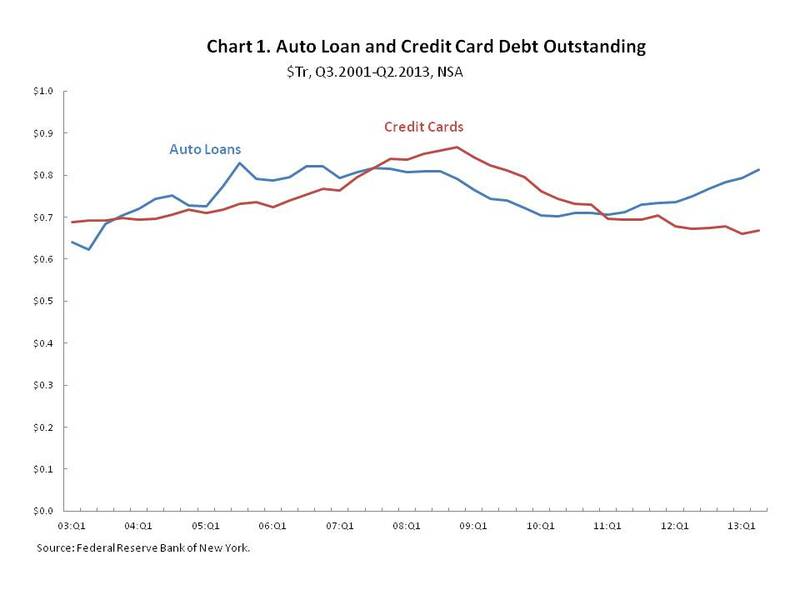 However, since the first quarter of 2011, the amount of auto loans outstanding has begun to increase while the level of credit card debt outstanding continues to decline. In the second quarter of 2013, the latest data available, auto loans outstanding had risen to $814 billion while credit card debt outstanding had fallen to $668 billion. 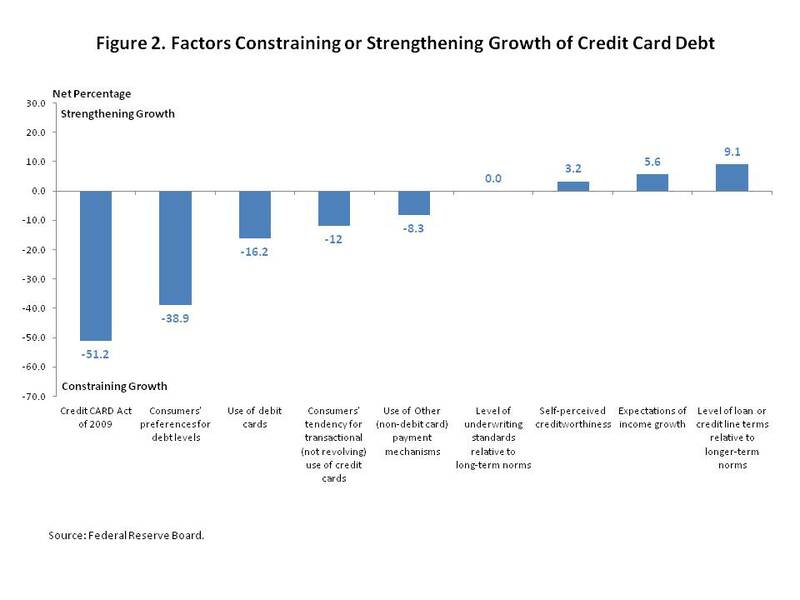 A previous post illustrated that the decline in credit card debt outstanding reflects a decrease in both the number of open credit card accounts and in the average amount outstanding. 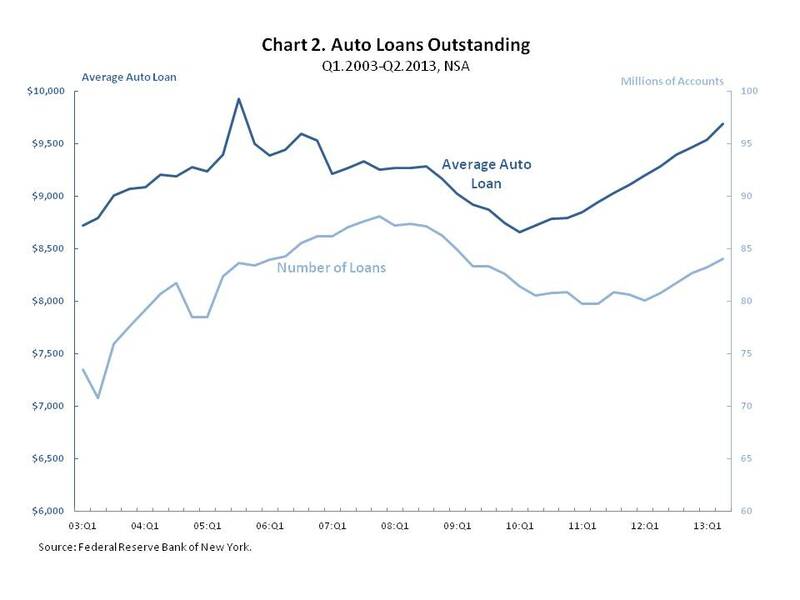 Conversely, both the number of auto loans and the average loan amount are climbing, but the average loan amount has risen more. The growth in the number of accounts and in loan size reflects consumers’ ability and willingness to finance car purchases. %. In contrast, the observed increase in mortgage demand is not being met with easier lending standards, holding back a more robust housing recovery. As chart 2 below illustrates, after dipping to 79.8 million accounts in the second quarter of 2011, the number of auto loan accounts has risen by 5.4% to 84.0 million accounts. Meanwhile, the average auto loan, calculated by dividing the total amount of auto loans outstanding by the total number of accounts, has risen by 11.9% since it reached its trough in the first quarter of 2010. Since the second quarter of 2011, when the number of auto loan accounts began to rise, the average auto loan has increased by 9.3%. Data released by the Federal Reserve Bank of New York indicates that aggregate consumer debt outstanding, which includes mortgages, contracted by 0.7% or $78 billion on a not seasonally adjusted basis in the second quarter of 2013. This is the second consecutive quarter that aggregate consumer debt has declined on a quarter-over-quarter basis and the 7th decline in the past two years. Over the past four quarters, which lessens the influence of seasonal factors, aggregate consumer debt outstanding has declined by 2.0% or $231 billion. Aggregate consumer debt outstanding has declined on a 4-quarter basis in every quarter since the fourth quarter of 2008. Overall, since reaching a peak in that quarter, aggregate consumer debt has contracted by 12.0% or $1.5 trillion. 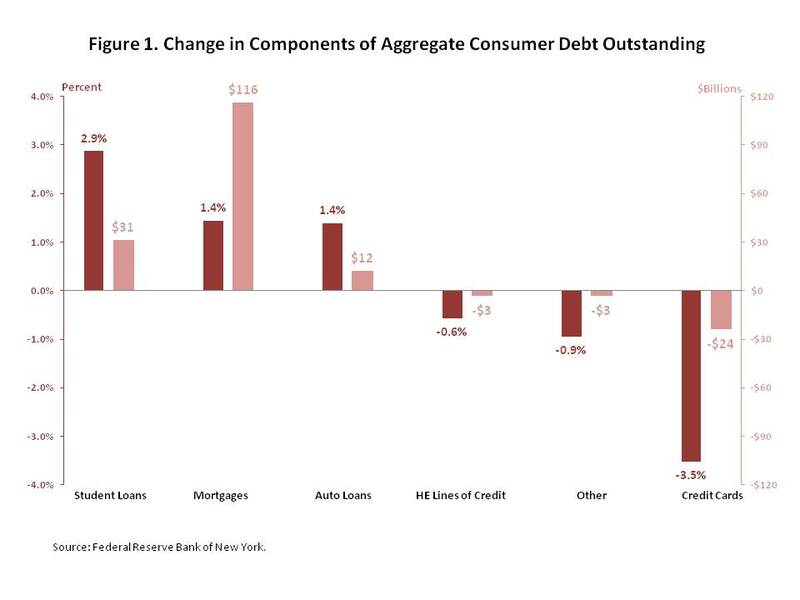 According to the data, the decline in total consumer debt largely reflected a contraction in mortgage debt outstanding. Mortgage debt outstanding, which accounted for 70.3% of aggregate consumer debt in the second quarter of 2013, fell by $306 billion, 3.8%, over the past year. Credit card debt fell by another $4 billion, 0.6%, and other consumer debt, which includes consumer finance loans such as personal loans and retail debt such as department store loans, was lower by $16 billion or 5.1%. These declines were partially offset by continued growth in auto loans and student loans. Over the past year auto loans have expanded by $64 billion, 8.5%, and student loans have grown by $80 billion or 8.8%. Mortgage debt outstanding falls when, on net, consumers either pay off or default on their mortgage. A previous blog post illustrated that a small portion of mortgages 30-60 days late reach the default stage, but the likelihood of default becomes all but certain if a mortgage becomes 90 or more days late. As a result, determining the likelihood that a mortgage moves from the 30-60 days late stage to the 90 or more days late stage can help analysts anticipate future mortgage defaults. A declining rate of transition from 30-60 days late to 90 or more days late suggests that mortgage defaults are having a shrinking impact on the amount of mortgage debt outstanding. 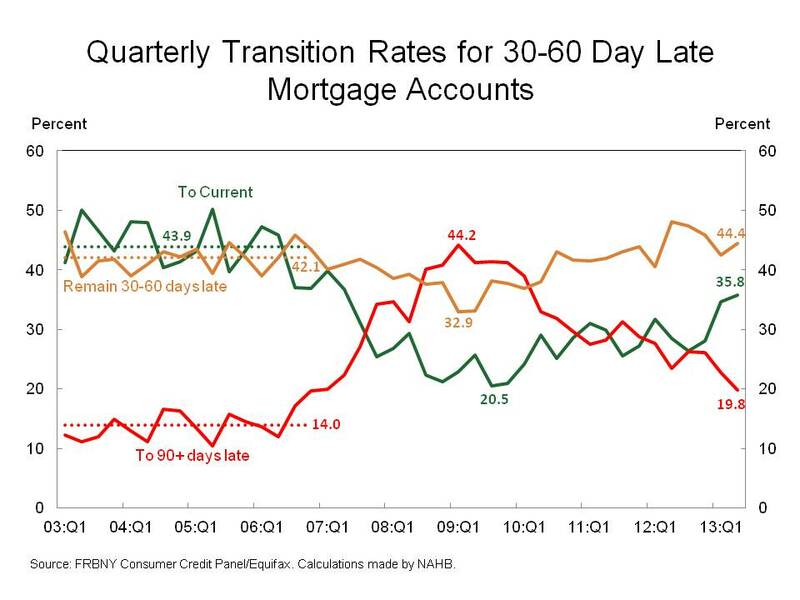 The chart above shows that the transition rate of mortgages 30-60 days late to 90 or more days late, which averaged 14.0% between 2003 and 2006, peaked at 44.2% in the first quarter of 2009 but has since declined to 19.8%. An increase in the transition rate from 30-60 days late to 90 or more days late means that a smaller share of mortgages that are 30-60 days late either “cure” or remain in this stage. According to the chart, the percentage of mortgages remaining 30-60 days late declined between 2006 and 2009, but the “cure” rate fell even more. After dropping to 20.5% in the third quarter of 2009, the “cure rate” has since risen to 35.8%, but it is still 8.1 percentage points below its 2003-2006 average. The residual, the portion of mortgages remaining 30-60 days late, has climbed 11.5 percentage points to 44.4% and is 2.3 percentage points above its 2003-2006 average.